Often problematically labeled as “Brutalist,” the concrete architecture that transformed Boston—and many other cities—during 1960s and 1970s was conceived with ambitious social ideals by some of the world’s most influential designers. Heroic: Concrete Architecture and the New Boston tells the story of a city, a material, and a movement, and how these intersected in the postwar era to make Boston an epicenter of concrete architecture worldwide. At a moment when concrete buildings across the nation are in danger of demolition, Heroic surveys the aspirations of this earlier period and considers anew its legacies—both troubled and inspired. 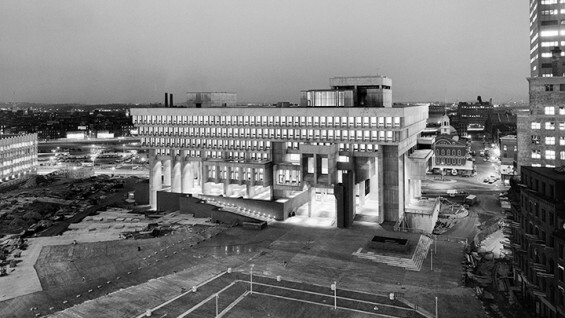 Among the most evocative and controversial landmarks of this movement, Boston City Hall has remained one of the most misunderstood buildings in the United States ever since the design’s public unveiling in 1962, following a nationwide competition. At its opening in 1969, critic Ada Louise Huxtable hailed the building's power, but wrote of the “architecture gap” between its exceptional design and the public’s already unfavorable reception. Join authors Mark Pasnik, Chris Grimley, and Michael Kubo in conversation with architect Michael McKinnell, who designed the building with Gerhard Kallmann, on the origins of their work and the structure’s contentious history in the decades since. Joan Ockman and Anthony Vidler will help unpack the complex social and architectural questions surrounding concrete modernism in the United States as reflected in the Boston City Hall competition, a major event within the architectural discourse of the 1960s.